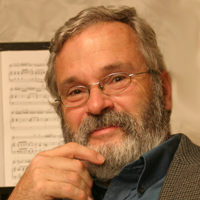 Hollis Thoms is an Annapolis composer who has written over 125 works for a variety of ensembles. He has a BA from Concordia University Chicago, an MM from Northwestern University, an EdS in educational administration from the University of Toledo, a masters in liberal arts from St. John’s College, Annapolis, and finished the course work for the PhD in musical composition from the Eastman School of Music. His principal composition teachers were Richard Hillert, M. William Karlins, Warren Benson and Samuel Adler. In addition, he has been the recipient of a number of fellowships: the year-long Joseph Kingenstein Fellowship to Columbia University to do research and creative work in English and music, writing a 45 minute song-cycle, “Sargasso,” for soprano, cello and piano based on the poetry of Sylvia Plath as part of his fellowship year project that was performed at Columbia University during his fellowship year; an Alden B. Dow Creativity Fellowship to write the ballet, “Love Journey,” based on the writings of Dante; was a Fulbright Exchange Teacher to Scotland where he wrote “Postcard” for orchestra which was later performed by the Northwest Symphony Orchestra under the direction of Dr. Paul Vermel; and was selected to participate in the summer seminar for school administrators at Harvard University. In addition, he has had 40 articles published in educational journals on a variety of administrative and teaching topics and composed over 125 works for a variety of ensembles. He has also been a teacher of music and English, a school administrator and regional director of schools. A number of articles specifically on composition have been published, including: “Encouraging the Musical Imagination through Composition” appeared in a book entitled “The Best of MEJ: Creativity in the Music Classroom” edited by Donald L. Hamann, published by MENC in 1991, “Witnessing the Raw Power of Bach’s Creativity: Two Composing Scores of Johann Sebastian Bach,” published by PAN PIPES in 2009, “Creating the Libretto and Music for Passion: Nicodemus’ Transformation from Doubt to Faith,” published by CrossAccent in 2012; and, “Rolling His Jolly Tub: Composer Elliott Cater, St. John’s College Tutor, 1940-1942” in St. John’s Review. In 2005 his “Requiem for 9/11” for soprano and string orchestra was premiered at St. John’s College, Annapolis. This 40-minute work is based on five new poems by American poets on the 9/11 tragedy and ends with a setting of Rainer Maria Rilke’s “Herbst.” In 2007 his one act, hour long, opera “Socrates” was also premiered at St. John’s College and included talks by distinguished St. John’ College tutors on the significance of the death of Socrates. As part of the Abraham Lincoln bicentennial celebration, “The Moustache” a 90-minute work for four singers and chamber ensemble was premiered in February 2009 and is based on an historically possible meeting between Cipriano Ferrandini, an Italian barber who was central to the Baltimore Plot of 1861 to kill Lincoln before he was inaugurated, and John Wilkes Booth, who eventually killed Lincoln in 1865. The opera brings to life the meeting of these two conspirators on March 24, 1865, a few weeks before Lincoln’s assassination. “The Rime of the Ancient Mariner” for soloists, winds and percussion was premiered in February 2010 at St. John’s College and “Passion” for soloists, mixed choir, and chamber ensemble based on the Gospel of John, the Gospel of Nicodemus and a variety of religious poetry was premiered at Christ Lutheran Church Inner Harbor on the Bach Concert Series of Baltimore on March 27, 2011. On October 7, 2012, the Bach Concert Series also premiered his “Isaac” based on the Abraham and Isaac story, scored for treble choir, four soloists, three percussionists and organ. He has just completed another chamber opera “Serpent in Eden” based on the treason trial of Aaron Burr. He has written three symphonies and his “Symphony 2” will be premiered in January 2014 by the Londontowne Symphony Orchestra. Mr. Thoms has written works for a variety of ensembles from solo to orchestral, many on commission, and also for his own professional musician wife, Jacqueline, and children: Dr. Jason Thoms (BA St. Olaf College, MM and DMA, Michigan State University), director of choral music at Concordia University New York; daughter-in-law, Treva Thoms Foss, opera singer and adjunct voice teacher at Concordia; Sonja (Thoms) Winkler (BA Eastman School of Music, MM Rice University), oboist and conductor, and Director of Touring and Operations with the Pittsburgh Symphony; son-in-law Jordan Winkler (BA West Virginia University, MM Carnegie Mellon) trumpeter with the River City Brass Band; and Jonas Thoms (BA Eastman School of Music, MM University of Cincinnati) is instructor in horn at Wright State University, Dayton, Ohio. www.hollisthoms.com.